Burnley and Liverpool still locked in talks over fee for striker Ings! Burnley and Liverpool are still locked in talks over a fee for striker Danny Ings, though they could push for an English record fee at tribunal. While the 22-year-old is expected to move to Anfield on July 1st, subject to a medical, after agreeing personal terms, the two clubs have yet to reach a ‘middle ground’ over a transfer fee. Earlier in the week the club announced that they’d rejected an initial offer from the Reds but would ‘continue to have dialogue in order to reach a resolution over the fee’. 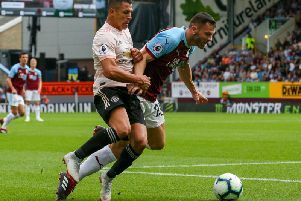 If no agreement can be reached in terms of a compensation package then the fee will be set by a tribunal, the Professional Football Compensation Committee, with Ings being under the age of 24. Should negotiations break down, the Clarets could be in line to receive a figure more than the £6.5m that Chelsea were ordered to pay Manchester City for Daniel Sturridge in 2010, in what remains an English record for a fee set by tribunal. That fee included a series of payments based on appearances for his new club. Tottenham’s reported £12m offer for Ings, at the end of May, an attempt to hijack Ings’ potential move to Anfield, could aid the club’s argument at tribunal and push the fee beyond the club record sale of Jay Rodriguez who moved to Southampton for £7m three years ago. The England Under 21 international, who overcame an injury ravaged start to life at Turf Moor, went on to score 43 goals in 130 appearances for the Clarets, including 11 in his first season in the Premier League.